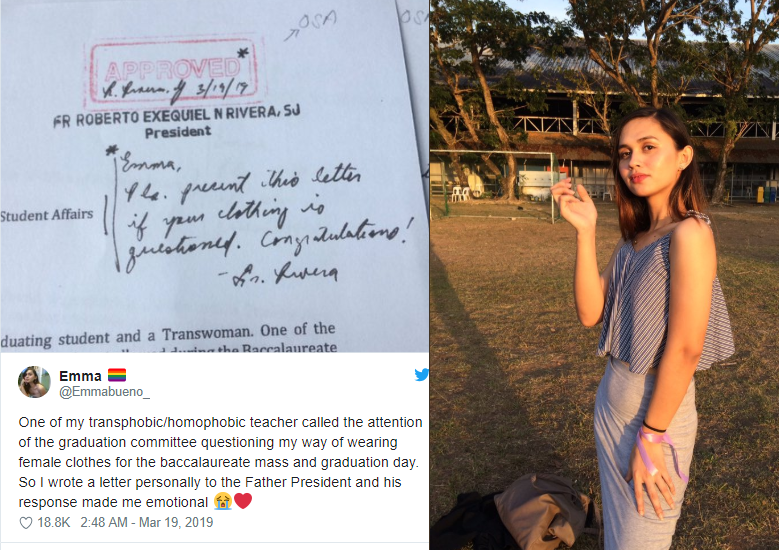 Manila, Philippines - A trans woman student from Ateneo De Naga University happily shared on her social media account her wish that was granted by the university's president, to wear a woman's dress during graduation. The Jesuit-run University has allowed Emma Bueno to dress up as female on her graduation day. Bueno, a graduating student and a trans woman wrote a letter to ADNU President Roberto Exequiel Rivera after being questioned by graduation committee for her intent to wear female clothes for the baccalaureate mass and graduation day. "I have gained support of my parents, relatives, friends, peers, and the Ateneo community itself ever since I started transition," it could be read on Bueno's letter. “One of my transphobic/homophobic teacher called the attention of the graduation committee questioning my way of wearing female clothes for the baccalaureate mass and graduation day. So I wrote a letter personally to the Father President and his response made me emotional,” Bueno stated in her Twitter post on March 19. The response of the father president overwhelmed her. "Please present this letter if your clothing is questioned. Congratulations!" Rivera wrote on Bueno's request letter with the approved stamp. Fr. Robert is such a kind and wonderful person (as with most Jesuits I know)! Even when he was still a chaplain at my primary school. Good on him to support you. Congrats on graduating! Fr. Robert Rivera is really an understanding and open minded Jesuit. Glad to know he is your University President. He deserves the position and you deserve to have a president like him. Best regards Fr. Rivera and congratulations Emma! All the best! Thanks for sharing this. That’s such great news!! In this day and age, it’s extremely difficult to fight for equality and representation. Proud of you! Congratulations!!!! !